When I’m not flat out with work (or even when I am) I fit in the odd speaking gig here and there. The next few weeks and months are particularly busy, with speaking engagements coming up at a range of events across the world. First up there’s this great local event in Belfast, organised by the awesome folks at The Tomorrow Lab. Every edition of #TTLPresents is bigger and better, and I can honestly say it’s the best digital marketing event in Northern Ireland, bar none. This edition has a great speaker lineup, and there are only a handful of tickets left. If you want to attend you better grab one soon! Another local event, this time in Cookstown and aimed at local businesses that want to grow their revenue using the web. I’ll be delivering an introductory talk on SEO with a special focus on local search. It’s free to attend, and you can read more about it here. We’ll be doing a second run of this event in Bangor on 18 October as well. I’ll be hosting a seminar for the lovely folks at SEMrush, on the topic of in-house SEO for big brands. 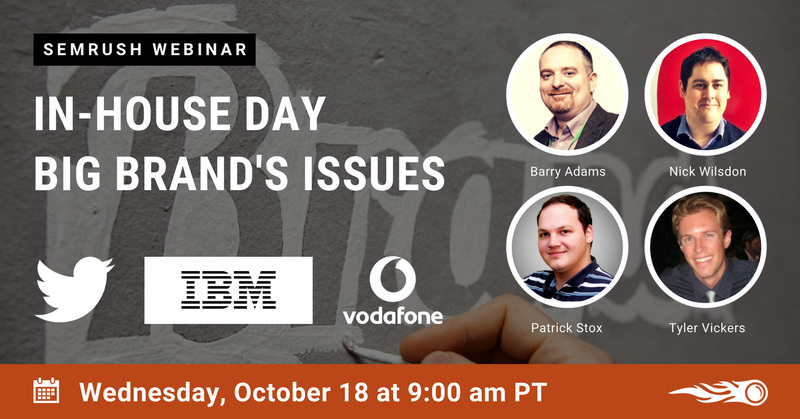 I’ll be joined by Nick Wilsdon from Vodafone, Patrick Stox from IBM, and Tyler Vickers from Twitter to talk about all aspects of enterprise-level in-house SEO. The webinar is free to view and you can register here. Later in October we’re heading to Dublin where I’m speaking at the 3XE Digital event. My talk will focus on the future of search, showing how you can tap in to new search technologies such as voice assistants and contextual triggers. It looks to be a solid event, with one of my industry heroes Lisa Myers also delivering a talk there. Find out more about 3XE Digital here. I’m running the second edition of my technical SEO training in Dublin on 27 October. The feedback from the first course was amazing, and I’ll try to make this next course even better. In this course I’ll cover topics like basic web technology, crawl optimisation, load speed and mobile SEO, and structured data. If you want to become a better all-round digital marketer, or learn to build perfectly optimised websites, this technical SEO course will help you achieve that. Since its inception, Lean Inbound has delivered amazing events with world-class speakers. Their next event on the first of November promises to be the best one yet, with a dream-team of speakers, a bigger venue, and yours truly on stage as the MC to tie the talks together and perhaps crack a few cringe-worthy jokes. This is really a must-attend for all marketers on the island of Ireland. I cannot recommend this event enough. Once again the Pubcon organisers have managed to book a range of excellent keynote speakers as well, and the social events around the conference promise to be epic as well. I’ll be sticking around in Vegas for Ungagged, a special intimate conference series where the attendees are asked not to share on social media what they hear in the talks. This allows speakers to talk off-the-record about some of the really interesting tactics they use to drive online growth. I’ll be speaking at UnGagged about how to ensure the recommendations in an SEO audit result in tangible improvement for the website in question, and will share some of my ‘secret’ SEO tips as well. If you want to get a 15% discount off the standard UnGagged ticket price, use this special ticket link. I won’t have much time to unpack after Las Vegas, as the following week I’m off to Milan for the Marketing Business Summit. This event aims to provide very actionable and hands-on talks that allow the attendees to turn theory in to practice and help their business succeed. I’ll be sharing my expertise in SEO audits and provide actionable tips to help SEOs and marketers improve their websites for search. After all that travel across the Atlantic and Europe, we’re back to celebrate all that is awesome about the search industry at the annual UK Search Awards.